If your case is charged in a Louisiana Federal District Court (Eastern, Middle or Western), you may be exposed to additional counts that can increase your sentence under the Federal Sentencing Guidelines. 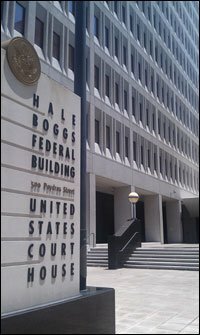 The Federal Sentencing Guidelines are used to determine your sentence based largely on the number of counts, the quantity of the drugs involved, the level of an individual's involvement, and one's criminal history.Criminal Defense Attorney in New Orleans, Louisiana, Hale Boggs Federal Building, United States District Court for the Eastern District of Louisiana In such cases, our goal is to limit the government's ability to prove your involvement in a larger conspiracy. As a law firm, we are compassionate in guiding our clients through the Federal system. If you have been charged with a federal crime, contact us now for an immediate, free evaluation of your case.